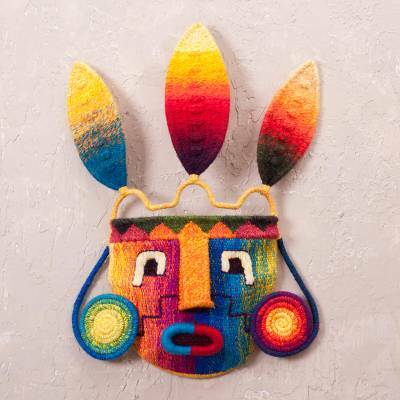 Inca-Inspired Handwoven Alpaca Blend Wall Mask from Peru, "Rainbow Inca"
Inspired by legendary Inca warriors of old, Peruvian artisan Inka designs this vibrant and striking wall mask. This mask depicts the face of a warrior with coiled earrings and three feathers atop the head. Inka weaves this mask from an alpaca and cotton blend. The yarns are carefully arranged so that they create a rainbow ombre effect when woven together.